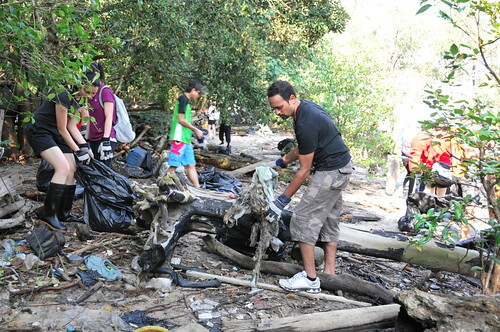 The International Coastal Cleannup Singapore has announced a programme for Year-Round cleanups for the beaches at Tanah Merah East in 2012. They are mnow recruiting volunteer Site Buddies interested in managing cleanups three times a year. To find out more, click the image below. The ICCS Otters who coordinate the island-wide International Coastal Cleanup Singapore were busy congratulating fellow-volunteer Cheng Wei Siong for his appearance in Today's National Day feature called "Singapore Dreaming". Written by Temasek Polytechnic students pursuing a Diploma in Communications and Media Management, the special featured a variety of Singaporeans - "To imagine what this island nation could be like 20, 30 years from now, is to look inside the heads of its dreamers." Sharing the page with Wei Siong is fellow-environmentalist Raina Ong who says, "I wish we all recycled". In the ICCS programme, Wei Siong keeps the company of an illustrious group of volunteers who have served with the programme for many years, adopting a slow and steady approach to prevent burn out and disappearance. They recce sites, communicate and mentor organisers, coordinate cleanup sessions, ensure data submissions are accurate, blog, twitter and are the most tireless on the shores during the actual cleanups. Year after year, for they are all veterans. When National Day dawned on 9th August, the ICCS Otters were cheered to see Wei Siong featured and delcared him a "poster boy" for the ICCS! Though a relative youngster, Wei Siong has been with the programme for eight years as participant, Site Captain and Zone Captain since his secondary school days (he is now a 2nd-year student in NTU). He has weathered his 'O' levels, 'A' levels, army days and university life while maintaining a role as a coordinator of the programme all this while - as he says in the article, "we have a personal responsibility for the health of the ocean". The beauty of all this? Like his fellow coordinators, the only physical thing he gets from the programme is a t-shirt! The real reward, obviously, is priceless. "I hope people realise that every little action makes a difference"
"It's easy for him to hit Control-C and Control-V whenever he comes across a website talking about the ailing environment. 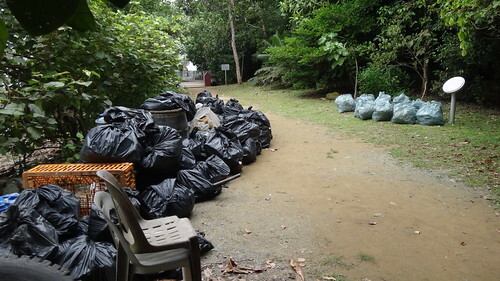 But for Cheong Wei Siong, forwarding emails to his friends and leaving website links on their chat windows is never quite as fulfilling as his work with International Coastal Cleanup Singapore (ICCS). There, he is able to reach up to 1,500 Singaporeans a year. And it is his hope that more people would have their eyes opened to the impact of their everyday actions on the environment. 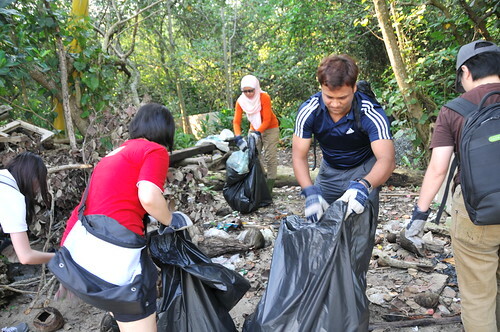 It takes more than just getting the participants of ICCS' programmes to pick up the bottle caps, toothbrushes, plastic cups and other litter that pollutes the shores. Mr Cheong tells them stories of how birds, turtles and fishes are harmed after swallowing such items. And when participants, who are usually sent by schools and companies, witness this first hand, they can see that "marine debris doesn't fall from the sky but from human hands". Before each cleanup, participants attend workshops where they learn how the collected trash contributes to data used in tackling marine pollution. It was his experience in just such a programme with his secondary school eight years ago that led Mr Cheong to contribute to the ICCS' cause. He came across a few horseshoe crabs entangled in discarded nets. "It was a disheartening sight," he said. "This very first cleanup made me realise that we have a personal responsibility for the health of the ocean." He remained active throughout his JC and army days, serving as a mangrove site coordinator for three years. Now, he oversees the cleanup operation on beaches along the country's north-eastern shore. But the nature lover, who is now pursuing business administration at the Nanyang Technological University, still believes it is the little actions that go a long way. At home, he switches off the lights when not in use and keeps his air conditioner at 25°C. "As long as people do the minimum, that's actually really good already," he said." 13 Apr 2010 - Ocean Conservancy releases Trash Travels: From Our Hands to the Sea, Around the Globe, and Through Time, the only global snapshot of the marine debris problem facing wildlife, economies and marine ecosystems. 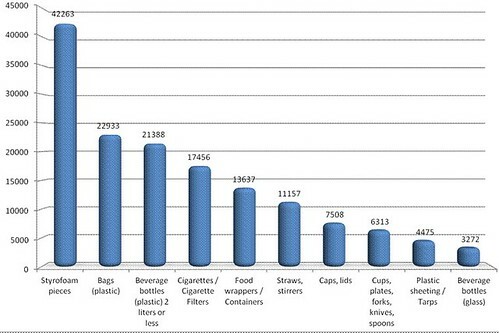 See the Ocean Conservancy page for a summary. To read the full report, download the 11MB pdf here. 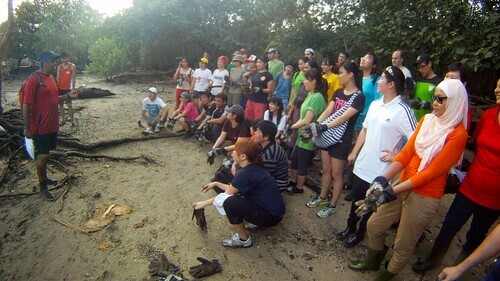 19 Sep 2009 - During the International Coastal Cleanup last Saturday, the team who arrived there early that morning encountered a mud lobster out of its element, on the beach. 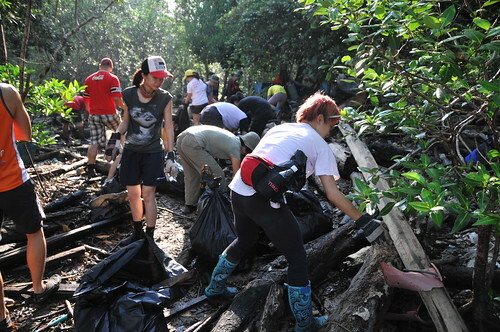 Participants told each other that it was "welcoming us to clean the beach." Apparently it was there for at least an hour before they lost of track of it while engrossed in the cleanup. "Stream full of trash through a Hidden Paradise," by Ng Kai Scene. 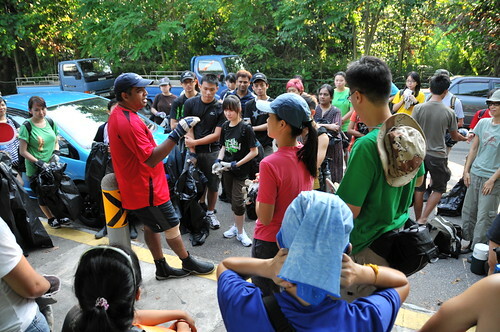 News from the International Coastal Cleanup Singapore, 19 Sep 2009. 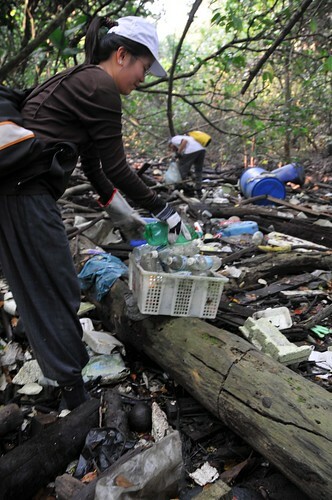 "Water-Crossing at Pasir Ris Site 6 (aka Hidden Paradise)," by Lim Chen Kee.News from the International Coastal Cleanup Singapore, 20 Sep 2009. The Raffles Museum Toddycats who coordinate the International Coastal Cleanup Singapore (ICCS) met last night over Old Chang Kee curry puffs and a couple of pizzas in NUS. The Zone Captains, Data Manager and a few others sorted through the information, requests, email conversations and reallocations that have been pouring in since May in order to update the status of the organisations and sites that will be the scene of activity on the morning of 20th September 2008. 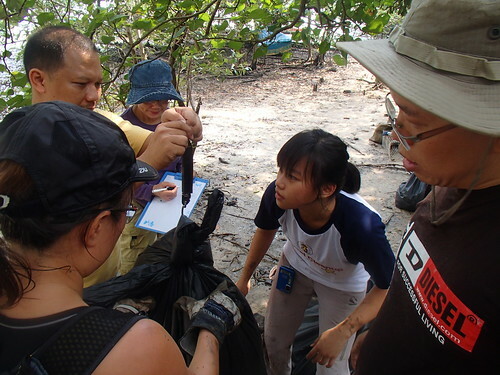 It won't just be volunteers in Singapore that hit the shores that day, volunteers in countries around the world will be taking to the beach as well, in order to data for a global perspective about marine trash. At this stage, beach and mangrove recces have started - these are being conducted by Zone and Site Captains and also for new organisers at various beach and mangrove sites in preparation for the actual day. A briefing for Site Buddies who help supervise operations will be conducted on 13th September 2008. 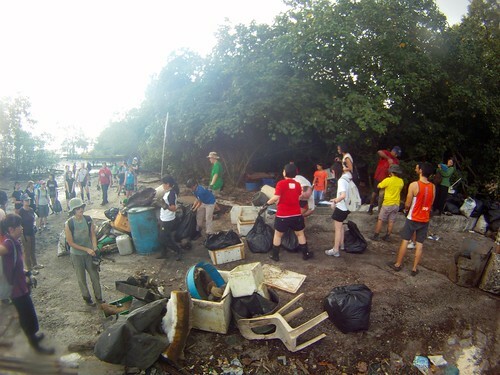 More news uupdates will be posted to the ICCS blog at coastalcleanup.wordpress.com. Horseshoe crabs have been around for at least 445 million years, predating the dinosaurs and they are facing their greatest challenges during the Anthropocene - habitat loss, pollution, over-fishing and ghost net entanglement. The latter arises when fishermen abandon or lose their strong mono-filament gill nets; these do not degrade but will instead repeatedly entangle all sorts of animals in mangroves, rocky shore, coral reefs, sea grass and sandy shores. This is happening in Singapore too. Like my fellow naturalists and field biologists, I have had to rescue horseshoe crabs, forceps crabs, birds and even snakes over the past two decades. Habitatnews has highlighted just a couple of these rescues (e. g. Lazarus Island, 2004; Mandai, 2005) and the Nature Society (Singapore) has a regular rescue team that works the Mandai mudflats. These days it seems almost every low tide trip to a mangrove reveals ghost nets - e.g. shooting for Once Upon a Tree 2, a shore visit suring the last Pedal Ubin and the recent Lim Chu Kang mangrove cleanup as well. Mandai mudflats and mangroves have such a high incidence of ghost nets that I pack a scissors and factor in time for gill net removal each time before I set out - film shoot, education trip or work trip. 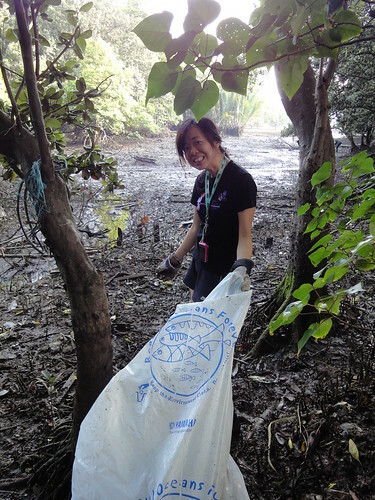 Unfortunately, today was no different - NUS biology honours student Theresa Su, Raffles Museum Toddycat Teo Kah Ming and myself carefully released about 20 mangrove horseshoe crabs that were still living. Kah Ming had counted 87 carapaces entangled and adacent to the net so most had died some time ago. We checked each individual to be sure and carefully removed the nylon filaments that had weaved between and around their limbs. The chelicerates (horseshoe crabs are not crabs) were not feisty but happily not too limp - so they were recent entanglements but probably not last night's. Once freed, we left them clustered in various tide pools nearby with some hope that they would survive. The net was cut into three lengths and carried out in a bag made from a large-mesh ghost net lying nearby. There are still nets out there, I know, and with research trips increasing, hopefully it will come to a time when my scissors can stay in the bag! Mangrove horseshoe crab entanglement at Mandai Besar mangroves. - about 20 of 87 entangled chelicerates were still alive. Another animal cleared of entanglement by our trusty scissors! I found the NEA's Local Weather page useful for monitoring cleanup sites during the International Coasta Cleanup Singapore last year. The data from weather radar is updated every 15 mins and now I see that you can click to add overlays including those of HDB towns, nature parks and MRT stations to help orientate you. I do wish NParks URLs to which the park icons are linked to were named URLs instead of numbers so they could double as landmarks without having to click through, but it all an excellent enhancement by NEA to the weather page. This image was taken during the mid-afternoon shower over Holland Village today.